Marcela began working at Chapman in 1998. 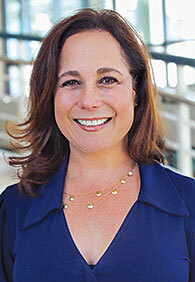 Prior to CU, she worked as an admission and financial aid counselor at her alma mater, Loyola Marymount University. She was a first generation college student and has found a passion in challenging young people to consider higher education as a stepping-stone to opening up doors and windows to a brighter future. She lives in Orange County with her husband and two boys and enjoys traveling back home to Colombia to be with family. During the coming months you will be making comparisons between many of the colleges and universities in the country and I want you to know that the admissions counselors, our students, staff and myself are all available to help you make the right college choice. Good luck with your college search and I’d love to hear from you if you have questions concerning Chapman, or to meet you during your campus visit. Our campus has numerous fountains and meditation spots. I love the new Global Citizenship Plaza, The Fish All Faith Center especially the "Garden of the Senses." There are many days of hard work mixed with fun and laughter. I am fortunate that so many of our students that I have met in my days in admission have truly become my friends. I am so lucky to have so many opportunities to be touched by the lives of so many young people day in and day out. Studying abroad in Granada, Spain planted the travel bug in me. There are so many amazing things to experience around the world. You can see different natural landscapes and climates that do not exist here. There are historical landmarks in every country that helped shape the history of the globe. You can expand your knowledge of the world by actually being there, seeing it, touching it, and experiencing it. Pictures in textbooks simply do not do justice to standing under the Alhambra. I was able to backpack and travel all over Europe. This experience magnified my love of travel and learning about people and cultures. Role Model: Traits of my role models: Hardworking, incredibly curious (eager to learn), networks (values people/relationships), works on self, creative (sees new combinations, new opportunities), self-reliant, keeps perspective, lives in the moment, doesn’t waste time (uses it), sees the future, responds instantly (decisive). Some examples…Oprah Winfrey, Eunice Kennedy Shriver, Nelson Mandela, Mother Theresa, Ellen Degeneres. Favorite Summer Activity: Anything outdoors and if I’m by the water or in a hammock it makes it better! Dream Job: Being a person of service for others, while being able to travel and experience the world around me.